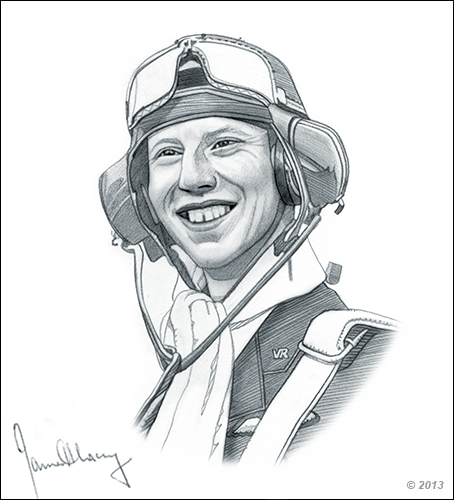 James Harry "Ginger" Lacey was the first Spitfire fighter pilot to fly over Japan in WW2. His final kill of his career was a Japanese aircraft. This was just one of his great achievements as a fighter pilot. Find out more about him as you read through his biography. James Lacey was born on February 1, 1917 in Wetherby, West Riding of Yorkshire. He went to Kings James’s Grammar School in Knaresborough from 1927-1933. He was good in sports and excelled in his studies. When his father died in 1933, he showed little interest in farming so he trained as a pharmacist. He was able to pass the intermediate pharmacist exams in 1936. However, his heart was not into the medical field so he pursued his dream as a pilot. He then joined the newly formed Royal Air Force. James Lacey was the son of Charles Lacey and Mary Brown Smith. His father was a cattle dealer and died in 1933. On one of his trips to India, he met Sheila Latchford on the ship and they fell in love. They got married on July 8, 1945 at the Sacred Heart Church in Kodaikanal. They had 3 daughters namely – Diana, Wendy and Susan. May 10, 1940 - He was posted to No. 501 Squadron and had his first air combat. May 13, 1940 - James Lacey destroyed a German He 111 bomber, a Bf 109 fighter and a Bf 110 fighter in the same afternoon. May 27, 1940 - He won his 60th air combat. June 9, 1940 - He crash landed and almost drowned in a swamp. This happened during his operationial duties in France. He received a French award because of the event – the Croix de guerre. June 19, 1940 - The Squadron was withdrawn in England. July 20, 1940 - His first kill over England was a Bf 109E fighter of German Jagdgeschwader 27 wing. August 12, 1940 - He destroyed a Ju 87 dive bomber. August 15, 1940 - James Lacey destroyed a Bf110 and Do 17. August 16, 1940 - He claimed that he destroyed a Bf 109 fighter. August 23, 1940 - James Lacey was awarded the Distinguished Flying Medal. August 24, 1940 - He destroyed Ju 88 aircraft and severaly damaged a Do 17 bomber . August 29, 1940 - He destroyed a Bf 109 Jagdgeschwader 3 wing. August 30, 1940 - He shot down a He 111 bomber and damaged a Bf 110 before his aircraft was damaged by enemy fire. His engine failed and he decided to stay with his aircraft and crash land rather than bailing out. August 31, 1940 - He successfully ended the month by shooting down another German Bf 109 fighter. September 2, 1940 - He destroyed two German Bf 109 fighters and a Do 17 aircraft. September 5, 1940 - He shot down another two German Bf 109 fighters. September 13, 1940 - He destroyed a He 111 which had just bombed Buckingham Palace. September 15, 1940 - He ruined a German He 111 bomber and three Bf 109 fighters. September 17, 1940 - He was shot down during a dogfight by Bf 109 fighters but wasn’t injured. • September 27, 1940 - He damaged a German Bf 109 fighter. • September 30, 1940 - He shot down a German Ju 88 aircraft. • October 7, 1940 - He had a probable kill on a German Bf 109 fighter. • October 12, 1940 - He shot down a German Bf 109. • October 26, 1940 - He destroyed another Bf 109. • October 30, 1940 - He ruined a Bf 109 fighter and destroyed another one. • November 26, 1940 - He was awarded a Bar to his Distinguished Flying Medal. • March 24, 1941 - Flying a Spitfire, he seriously damage a Fw 190 fighter. • April 25, 1941 - Flying a Spitfire, he was able to damage a Fw 190 aircraft. July 10, 1941 - He destroyed a Bf 109. July 14, 1941 - He shot down a Bf 109. July 17, 1941 - He destroyed a German He 59 seaplane. July 24, 1941 - He destroyed two Bf 109 after they collided in the air. February 19, 1945 - His final kill was a Japanese Ki-43 aircraft. April 30, 1946 - He became the first Spitfire fighter pilot to fly over Japan. March 5, 1967 - He retired from the Royal Air Force as a squadron leader. On May 30, 1989, James Lacey died from cancer at the Castle Hill Hospital at Notingham. He was 72 years old. A funeral service was held before a plaque honouring him was unveiled at the Priory Church in Bridlington on September 2001. James Harry "Ginger" Lacey was a self-sufficient and undemanding man. 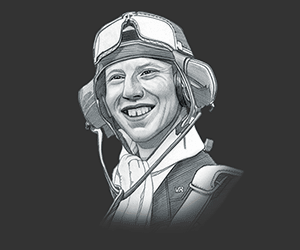 He is the best epitome of the many fighter pilots who were volunteer reservists during World War II. History should never forget such a man with so many credits to his name. This picture of James "Ginger" Lacey is Copyright © June 2014 Siteseen Ltd. We only allow this picture to be used for printed non-commercial purposes and particularly encourage it's use for printed educational non-commercial purposes. This James "Ginger" Lacey picture is not in the Public Domain. 3) Use of this James "Ginger" Lacey picture, or any of our pictures on websites re-distributing copyright free material is strictly prohibited.